Part 1 covered the history of Maingate and how it started / evolved. We also touched on how DJ's sometimes draw a bigger crowd than bands. The interview left off with exactly how long Maingate has been in business. Has Maingate ever shut down? Has it been continuously open? Dominic: Continuously. Most of the renovations we have done are done incrementally. We re-modeled the bar and DJ booth. The bar, we did in a couple of days. Some places spend like $1,000,000. Open the doors and expect to get that back. Here, it's more like, do it over time. The subtle changes, people do notice. Chances are, it will not bother them vs. shutting down and re-opening as a new club. Dominic (laughing): I don't know if they do take notice here. Pointing out a challenges most club owners face over time. Dominic: You have something that works. When you first start, you can do it 3 or 4 nights a week. People love it! Then you get down to: "They still love it. But, they only love it on Saturday or Wednesday. Now, you have to figure out what to do next. Who you are going to appeal to. How to re-invent yourself and give it (the club) a different feel. The big challenge with live entertainment is having the big draw bands can get you into a rut. Where you have the same bands over and over. Here is something you may or may not know about Maingate, going back to the club's history. Dominic also gives us a little from the personal side. 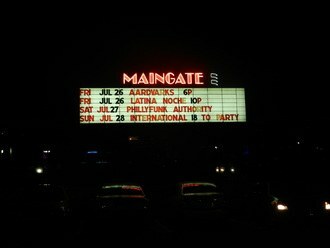 Maingate Nightclub is also a family tradition? Dominic: Yes, I am second generation. My father is 80 years old and still involved. My mother is still involved. Oh Really! (Yes, I was very surprised.) Dominic: There is 5 of us (brothers and sisters). I am the only one who decided to go this direction. Why did you? Dominic: I enjoy it (smiling). I have a music background as a DJ. I just love the nightclub business. I knew, at a young age, that would be what I want to do. I was lucky enough to be exposed to it. I have worked every position in a nightclub. You are not just an owner. You can help the staff and answer questions from work experience? Dominic: I can say that is the best experience I have. Is to have worked all the different positions. I have the family support. I am not in the nightclub business to pick up women. I am in it to make a living and help my family. You are truly passionate about it? Dominic: Yes. I had to ask about one of my favorite nights: Bike Night. How did that come about? Dominic: Another club that had it, went out of business. I saw the chance and went with it. I think it has been here for about 6 years. We have the parking and outdoor stage and space. Bike Night happens in the warmer weather and it is an outdoor event. Maingate is starting to have bands from other areas and above the local level. Is this going be a regular feature of the nightclub? Dominic: There is more shows on the books. Anything else people can look forward to in the future? Dominic: To make it into a dance club and concert venue. To be good at both. I did not ask Dominic for any details. Sometimes, I like to stay in suspense. Just like I try to keep you that way with any "part 1". I have to say this. Dominic is not the type to stay in the office. Every time I am at Maingate, I do see him out and helping out the staff. Thanks to Dominic for taking time for the interview. Thanks to you for reading it.